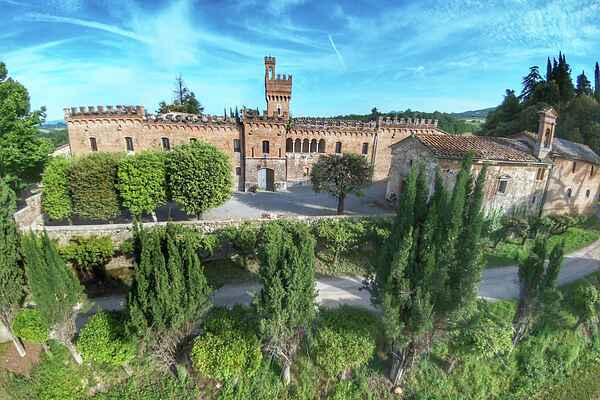 Castello is a castle from 1465 on an estate in an idyllic part of Tuscany with elms, pines, vineyards and olive groves between the Val di Chiana and Val d'Orcia. The exterior of the castle is of red brick and limestone bar. The interior is completely in the old classical style of Siena. The atmosphere is really special in this castle. If you spend a vacation here, you feel as the prince or princess of the castle. The castle garden is very beautiful. One part is an Italian garden and another part of the garden is planted with exotic trees. The countryside surrounding it is part of the estate that produce wine and olive oil. The castle is located along with several other rustic houses on the estate. The chateau has a private pool and there is a second pool which is shared with the rustic houses. On request, a cook will prepare the meals. Enjoy a holiday in a beautiful fairy-tale castle. It is also possible to organize parties or weddings at the castle and surrounding houses to rent (for 50 people).